I’m very excited (and a little nervous) to be participating in Meadow Mist Designs’ Midnight Mystery Quilt-a-long. There are some very accomplished quilters who are also participating. I’ve become moderately proficient with squares and rectangles, but I’ve only dabbled in triangles and have never cut/sewn any half square triangles, though they’ve been on my quilting radar for the last couple months. I’ll get a chance to try my hand at them as well as flying geese in this project. I know I will learn a lot from participating in this quilt-a-long, and it will be fun to see all the works-in-progress and finished quilts created by other quilter participants. Feel free to follow along at #MidnightMysteryQuilt on Instagram. The fabrics A-D are arranged top to bottom. Fabric A, Petal in Charcoal, is from Alison Glass’ Handcrafted line, and Fabric C, Penny in Peacock is also from this line. Fabric B is Laura Gunn’s Painters Canvas in Peach, and Fabric D is Alison Glass’ Text in Ocean. Earlier this month we were given cutting instructions for all the fabrics, but I just started cutting my fabrics today. I have part of both Fabric A and Fabric B cut. I hope to have all my fabric cut by August 5th because we get our first set of sewing instructions on August 6th. I can’t wait!!! Nice fabrics! Can’t wait to see how they go together in another fabulous creation! You’ve been reading mysteries for years. No wonder you’re intrigued by this Midnight Mystery project! I just picked up a collection of Handcrafted fabrics and I absolutely love them. Your selection looks wonderful. I’m always a bit wary of participating in a mystery quilt along since I am afraid I won’t end up liking the quilt. It’s great they tell you ahead of time which fabrics are near one another so that at the very least you get some combinations you like. Good luck! I think your fabric choices are fabulous. I have small amounts of both of those Allison Glass fabrics along with several others. The Peach fabric goes brilliantly between them, and you can never go wrong with text. 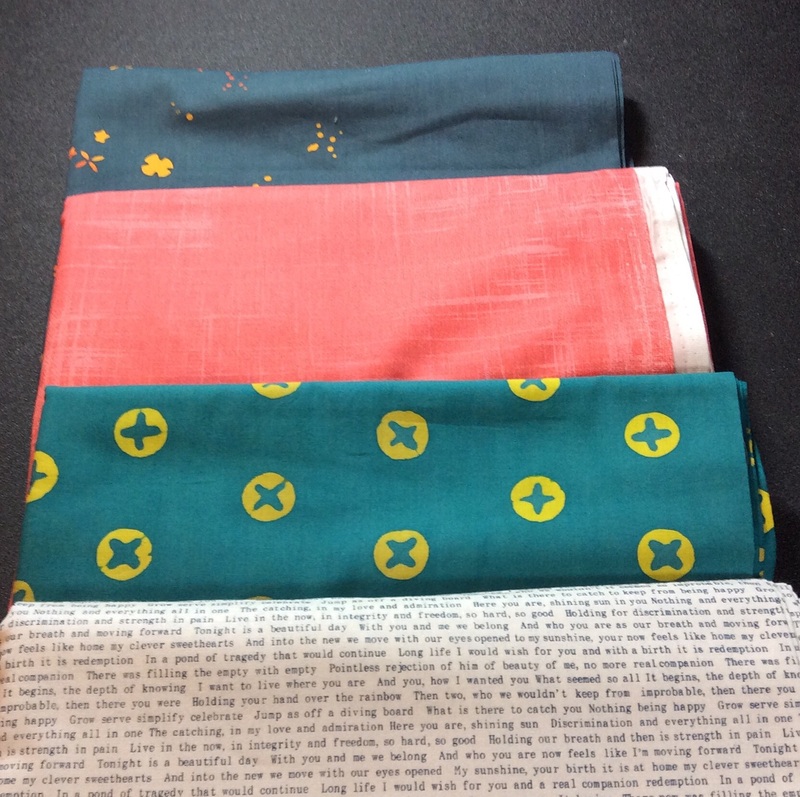 These fabrics are going to look awesome in the quilt! I’ve done a couple mystery quilts and really love the process of seeing the design develop. However, this is the first time that it’s been an online mystery quilt and I’m so excited about seeing everyone’s different palettes as we go. I hope you got your fabric all cut and are off and running with your flying geese. (I think the method Cheryl used is great!) I won’t be able to start sewing until after the weekend. I can’t wait!